The U.S. and North Korea summit drew international attention, Binoy Kampmark comments on the perspective from our Department of Foreign Affairs. TO SEE THE REACTION of Australia’s political and media establishment to the Kim-Trump summit in Singapore was to be reminded about the nature of fractured lenses and misguided assumptions. From afar, problems are either magnified or diminished, a situation made more problematic given a state’s satellite status and geographical proximity. The ABC had felt it important enough to send two mainstays to cover the summit on Sentosa Island and the clichés clotted the narrative. President Donald Trump was anointed as the disrupter of international relations; Kim Jong-un was considered the opportunist who dared. The view from the Department of Foreign Affairs and Trade was confused. Washington and Pyongyang have taken the lead, leaving allies slumped and bothered. To see Kim wandering the streets of Singapore was particularly irksome for Australian Foreign Minister Julie Bishop. Ironically enough, the step to becoming a rule abider is to firstly break the rules with fist punching defiance. Scorn the others and prepare for conflict. A cruel, if unpalatable, truth presented itself in Singapore: Had Pyongyang been meek, compliant and amenable, it would have ceased to exist as a regime, going the way of other labeled hermits of outlaw status — Saddam Hussein’s Iraq and Colonel Muammar Gaddafi of Libya are merely a few prominent examples. In April, Bishop sounded the note of a doubting Thomas in the wake of undertakings being made by Pyongyang to Washington. The theme of what constitutes the international committee of nations is a favourite in Canberra — a line normally used against regimes deemed beyond the pale. A “rules-based” order is code for U.S. drafters and the extensive reach of its lawmakers. This stance is endorsed with automatic ease by the drafters of Australia’s 2016 Defence White Paper, those who don America’s strategic dress. Washington’s stalking and inducing shadow tends to go by the wayside when it comes to general discussions on the subject. Often, the designation of states that breach this order is selective. While Canberra’s pen pushers and elected representatives are very happy to break laws when required – take the issue of refugees, asylum seekers and the degradations of indefinite detention – righteousness shall always out. It pays, when consulting the making of Australian foreign policy, to go to the White House press releases, or notes from the U.S. State Department and The Pentagon. Bishop, in terms of her functions, is at best a lower desk State Department official prone to test the winds from across the pond. Pyongyang is more than aware of this, scolding in October last year of Canberra’s willingness to join the “frenzied political and military provocations of the U.S.”. Bishop did nothing to disabuse the accusers, retreating behind the cover of propriety and good conduct. Australian Prime Minister Malcolm Turnbull has been even more direct about what conflict between the U.S. and the DPRK might entail. The winds on and towards North Korea have changed since, ceasing to be entirely glacial. In some cases, they are even conciliatory, leaving Bishop and Turnbull puzzled. As has the unqualified approach on the part of Washington for the “rules-based” formula, adjusted by such documents as the 2018 US National Defense Strategy. In the document, the authors insist that a realistic balancing of interests must take place alongside the rules. But Bishop cannot let on, her front erroneous in assuming that the rules are universal, liberal and objective, the stuff of international relations magic. 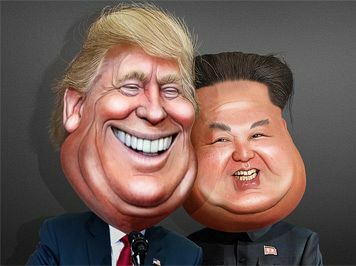 The Trump-Kim show supplies a different bag of tricks and they have only just begun. Dr Binoy Kampmark was a Commonwealth Scholar at Selwyn College, Cambridge. He lectures at RMIT University, Melbourne. You can follow Binoy on Twitter @bkampmark and email him at bkampmark@gmail.com. Isn’t it amazing that only democratic Govt that isn’t sceptical of Trump & Kim Jong-un union & summit is Australia. Turnbull & Bishop r beyond sycophantic & embarrassing. Trump wants to build his towers in North Korea.